The Habitat for Bush Birds program 2014-2016 (funded through the Victorian government’s ‘Communities for Nature’ program) is increasing and enhancing habitat for woodland birds, and in particular the ‘feathered five’: the Jacky Winter, Brown Treecreeper, Painted Button-quail, Diamond Firetail and Hooded Robin. Sixteen landholders have signed on to 10-year stewardship agreements to undertake habitat enhancements across a land area totalling 348 hectares. 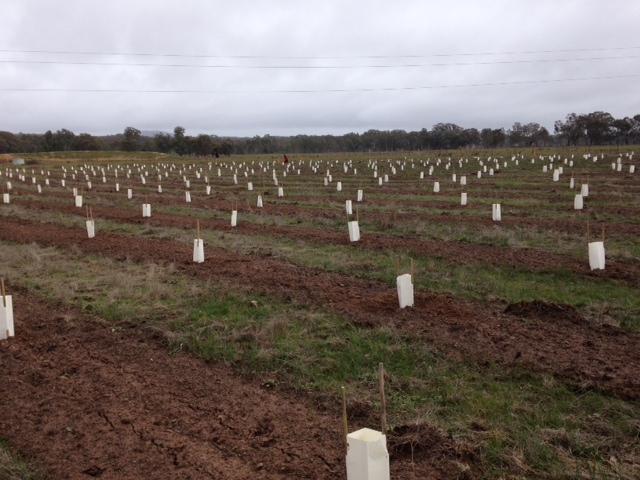 We were also able to provide some support towards the ‘40,000 trees’ revegetation project run by the Barkers Creek Network, which involved an additional 12 landholders and 41 hectares of revegetation. Habitat for Woodland Birds: Linking Mount Alexander to Metcalfe project 2015-2016 (funded through a later round of the Victorian government’s ‘Communities for Nature’ program) aims to enhance vegetation habitat linkages between the Mount Alexander Regional Park and Metcalfe Conservation Reserve. Local Landcare groups from Sutton Grange and Metcalfe have been incredibly enthusiastic and supportive, actively promoting the program which has engaged 4 landholders and restored 28 hectares through protecting existing vegetation and revegetation. The interest in this program from landholders has exceeded the funding we had available, which has encouraged us to seek further funding to implement ‘stage 2’ in the future. Each ten-year stewardship agreement and management plan involves an initial walk and talk with the landholders through their property discussing any management concerns or issues. In many cases, the walk-through has celebrated and acknowledged the extent of conservation work that the landholders may have undertaken on the property in the past. All landholders receive a plant list and a bird list for their property, and ongoing financial, logistical and technical support for the implementation of their plans. For more information on our on-ground works program, click here. Please contact Tanya to register your interest on tanya@connectingcountry.org.au or call 5462 1594. A sea of new plantings – the makings of a Woodland Bird habitat.